Click Here to Grab Your Special Report Now! 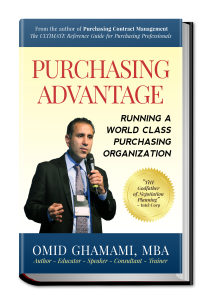 Do You Want to Learn the Secrets of Running a World Class Purchasing Organization? If you want purchasing theory, research, or pie-in-the-sky supply chain management concepts that leave you wondering what you should do differently when you get back to your desk, this is not the book for you. If you are looking for antiquated win/lose psychological leverage techniques that force suppliers to agree to your one sided demands – popularized by some of the biggest names in negotiation training – this book is not for you either. However, if you want to know breakthrough purchasing techniques that have been painstakingly gathered from the best of the best in every industry and geography over a 20 year period, married with powerful insight and strategies that you won’t find anywhere else, you are at the right place. Globally recognized author, professor, speaker, trainer, consultant, and long time Fortune 50 practitioner Omid Ghamami has put together the ultimate reference guide for purchasing excellence. Packed with process steps, templates, checklists, tips, and best practices, you will know *exactly* what to do differently when you get back to your desk. You could spend 20 years trying to gather this information yourself, or you can make these world class strategies a part of your arsenal right now when you get your copy of this internationally acclaimed book. Use Discount Code: d083c07c80 when checking out to save $10 today! Price Reg: $19.97 Today only $9.97! Get your copy now, before this special offer expires because you can CATAPULT your purchasing results, career and income potential, GUARANTEED! Copyright © 2014 Purchasing Advantage. All rights reserved.